Fast fashion retailer Zara is launching a mobile augmented reality app to be used in stores, which allows shoppers standing near certain displays to view AR images of models wearing different items from those displays, as well as purchase the merchandise through the app. Zara will begin rolling out the technology next month in about 120 of its stores. When Zara customers have purchases from the store delivered to their homes, they also will be able to use the app in tandem with promotional packaging to view AR images of other clothing items, according to reports. This sounds like a potentially intriguing use of augmented reality technology to bridge the mobile and in-store shopping experiences. 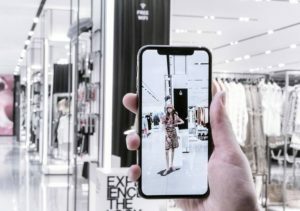 Though some retailers have used AR and virtual reality in-store to enhance the sales process and customer experience, most of the latest mobile AR apps are intended to be used online or on mobile (and not necessarily while in physical stores) to help shoppers view merchandise within the context of their own homes and lives. Zara appears to be taking a different path with this AR app by having it work with sensors on in-store outfit displays and some store window displays, as well as with AR-enabled packaging and promotional materials. What’s not clear at this point is if customers will be able to use the app outside of those two contexts. The AR app is Zara’s latest technology move. Earlier this month, the Wall Street Journal reported that the retailer was starting to use automated kiosks in stores and package-picking robots behind the scenes to help accelerate the in-store click-and-collect processes. Zara also opened a pop-up dedicated to digital sales in London back in January.